I don’t usually shamelessly plug customers reviews like this but this one really made my day! Whether you find success in Carley’s or another company, you should know that there’s always something out there that can help you. Sometimes it takes going pH neutral or getting rid of benzoyl peroxide completely from your skin care routine. Despite what the label says, Carley’s products tend to be very dynamic. The reason why is that the product lines are consistent with similar base ingredients and the same quality control processed throughout. Even the pH is kept about the same! Due to the moisturizing nature of many of the products, we’ve seen people have success with a wide range of products they’ve tried. Some consider these products universal in their uses – Especially the soap. What are some cool “off-label” uses we’re talking about? Rashes – Customers come to use everyday telling us that their pesky skin rashes went away after applying the Eczema Cream w/ Black Seed Oil. Burns and chapped lips – The Kukui Nut Body Lotion and Exotic Butter Night Time Moisturizer worked amazingly on my 2nd degree burns, cooling the skin better than any store-bought Aloe Vera cream ever could. I even use it on my lips when chapped if the Lip Balm isn’t nearby. Makeup base – Hair and Makeup Artist Jenny Karl swears by the Virgin Coconut Moisturizer. She uses it as a base before applying makeup for her clients. And yes that includes some pretty famous actors, models and fitness clients! Wart remover – The Clear & Smooth exfoliant worked wonders on a pesky skin wart I had. Apply a small amount and cover with duct tape (duct tape seals the skin better for warts). Here’s a full write-up I did on wart removal. Dandruff – I’ve found that the new Tea Tree Oil Cream will actually ward off dandruff from forming. Apply to the scalp, rub down for 15-30 seconds and then let sit on the scalp for 3-5 minutes. Male pattern baldness – This one may be a stretch but I use the Clear & Smooth exfoliant in my scalp every day. Studies show that stimulating the scalp increases oxygen to the blood under the skin and nothing is better than an exfoliant. Factor in the good ingredients in the Clear & Smooth and you have something that has miraculously prevented me from seeing the same balding effects that every other male (and female) in my family has seen. Full write-up here. Sunblocker, burn cover-up – The Mineral Makeup Foundation is a great sunblocker for your face. Even better, it’s the perfect cover-up for burns. The worse thing you can do for a large burn is to expose it to sunburns. Avoid scarification by blocking the sun over the burn. It doesn’t hurt your appearance to block a bad burn anyways. 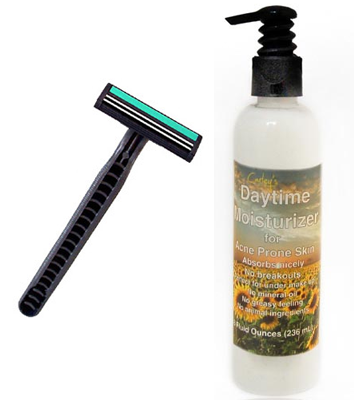 Facial shaving – The Daytime Moisturizer works as a great facial shaver. Even better than Daytime is now the Hair (yes, hair) Conditioner. So what about you? Are you finding any new uses for Carley’s products that we don’t know about? Send them here.